Mega Tiny Corp. has this week launched a new and very unique iPhone 6 and iPhone 6 Plus case that provides a convenient way of sticking your smartphone to smooth surfaces using nano-suction technology. Zero G “Anti-Gravity” cases will stick to glass, tile, stainless steel, mirrors, countertops, white boards, computer screens, windows, and even some walls. Allowing you to use your iPhone 6 smartphone hands free when taking photos or carrying out everyday tasks. 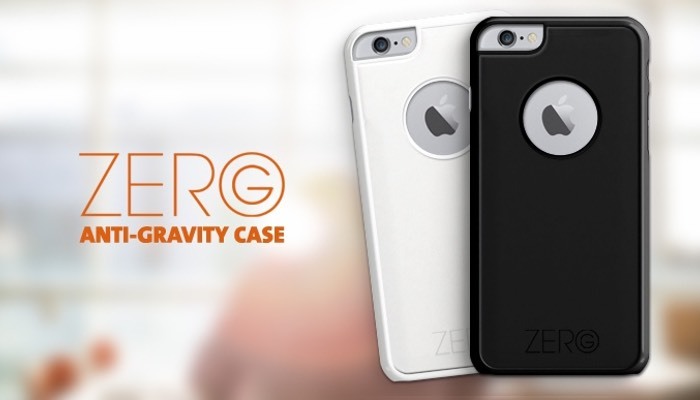 “The Zero G is a thin, yet durable case with slightly raised edges that protect your screen from drops. While tough, the Zero G is trim, only adding 3mm to the thickness of your phone (imagine the thickness of two dimes) making it easy to slip in and out of your pocket.